While in Belle Center, Ohio a few months back, I had dinner with Mark Curtis and a young couple in his community. One of my favorite moments came after Mark said something in Pennsylvania German which seemed to baffle the three other “native Amish” at the table. The man of the house, grappling with the fact that no one could put a finger on the meaning of Mark’s words, said something to the effect of “Mark’s more German than we are!” It was amusing, and I think tells you something for his appreciation for the language and culture he has joined. For our enjoyment Mark has sent along a list of Pennsylvania German words, arranged in similarly-sounding pairs. For some of you this is probably a cinch, for others like myself, baffling, and for still others, something in between. I’ve seen the answer key, and I can say that about 3/4 of these are nouns, in fact most are everyday items. Since there are different ways to spell Pennsylvania Dutch words, spelling here is approximate. And by the way, if these were English expressions I’d tell you #2 is what I say when I bite into something nasty, and #3 is how we used to say hello back when we were the “cool” kids in school. 38 responses to Do you know these 12 similar Pennsylvania Dutch words? Hi Mary! My name is Melissa Lynn Conquest. I am new to this site and o want to learn Amish Language. Because I live in Pennsylvania which is known for a lot of Amish speak people plus I am fascinated with the Amish culture and I like how they believe in putting god first before anything else. I believe that God should be the main priority for everyone. But unfortunately there aren’t bunch of people who believe in God. I'm not PD awwer ich lieb the language ! Guder Mariye ! Wie seid dihr ? Ich bin en beginner aa. Mary, were you peeking? Ich glawbe Du kannscht guut Deitsch schwetzah und eppa kennd dich net verkaafe….LOL. Agree entirely with Mary except for number 2. In our neck of the woods, blech (noun) was tin. It was also the name for a tin cup, usually used for drinking water. If something was tinny, it would be blechich. Thanks for the answer key, Mary! Eek, di Meis, fetch di kat! That is a smart way to teach words to kids and newcomers to the language. 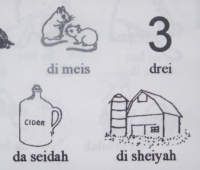 There is a language learning program out there that apparently, according to the TV commercials, uses speech, written words and images to teach language, so if the image above is a similar Amish tool, that would be useful. Terry, can you also deutch schwettza? 2. blech – The ch sound is sort of like you would exclaim in ycch! It means tin. As in a tin roof. A blech dach. 3. tsupp – This is like a small tab on something. The container had a small tsupp to pull it off with. 4. tsepp – This is a braid. Tsepp brot is braided bread. Hoah g’tsepped is braided hair. 6. brillah – sniffling and crying as in small children. 7. grattlah – Crawling or climbing. 8. griddlich – Fussy. As in a fussy baby. 10. schimpha – To complain or gripe about something. 11. schlissel – A key. As in a door key. Ja ja, Ich kann guut Deitsch schwetza, Ich wehss genug sell eppa kann mich net verkaafe. Wu warscht Du gebot? Ins Pennsylvawni, Ohio, oder Inshianna? Dei namah iss net deutch? Ich war gebot in die beschta blatz, Indiana. I’m going to continue being a total nuisance until someone tells me what verkaffe means. Sorry I spelled your name wrong last time. I used my sister-in-law’s spelling. What is verkaafe? But I’ll take a guess (probably also wrong) at Terry’s posting with “verkaffe”—sounds like coffee. I hope Terry doesn’t find me annoying, but I have almost no opportunity to test out what I have learned, and I have no PA Deitsch-English dictionary. “Kaafe” is to buy, but I don’t know about verkaafe. Terry said, “Yes, I speak good dutch. I know enough that some can myself (net verkaffe).” I know that is totally rough with confusing word order, and I probably got something flat out wrong. Thanks to all who might humor me. (no, tell me what you mean by verkaffe? no problem Naomi… can you figure this out? Sis zeit fa bett gay? Thank you, Mary! You said, “It’s time to go to bed.” “Go” took me a little while, because I’ve been spelling it, geh. But no kidding about the time! I had a project that had to wait until my daughter was asleep, and she is a night owl. Guti nacht! Wann a man sage, Ich wehss genug sell eppa kann mich net verkaafe…When someone says, I know enough that soneone can’t buy me it means that person speaks PA German well enough that someone can’t get something over on them. It’s an idiom that I grew up with here in Northeastern Pennsylvania. Maybe it doesn’t carry to other Deitsch speaking areas, although I’ve heard it in Lancaster County. To clarify also: eppis = something; eppa = someone. Nah mussich mei schoffa duh!! Mach’s guut alle!! Mei nomah s’iss net en Amische nomah, awwer Ich bin Deitsch gebot und gewoxt. Ich bin drei jarhungen ins Brudernkarrich, so Ich betrage en schwartz hut oder en stroh hut, gallussa, brehdfalle hussah, und schmuchlossig hemmd. My name is not an Amish name, however, I’m PA German born and raised. I’m third generation in the Brethren’s church, so I wear a black hat or straw hat, suspenders, broadfall pants, and plain shirts. I also raise fruits, vegetables, and eggs part time and work for a hospital full time. I asked my son, Mark, what verkafe means. He said that it means to sell. Kafe is to buy. When something is verkafft, it is sold. When something is bought, it is g’kafft. At least that is one Mark says. Don Curtis: Your son Mark is exactly right on all points. Terry, Mary, and Don. That was a fun lesson in PA Dutch. Ich gleich Pennsilfaanisch Deitsch schwetze! Is your son familiar with the phrase, “Ich wehss genug sell eppa kann mich net verkaafe?” I just wondered if they used it in his area? The problem is with the word “sell”. I would have used the word “ess”. Naomi, siss means It and geh means Go, so I was saying It is time to go to bed. Ei ei ei, Du machscht mich lache!! Wass iss dei G’mee oder Karrich? It is fun to read Pennsylvania Dutch! I’m surprised how well I understand all of what is written above. Once I was in Lancaster and an Amish man started speaking PA German to my mother and me as soon as we told him we were from Belgium and we speak Dutch there. We had no clue what he was saying. It’s clearly a lot easier to read than to understand. Looks a lot like German, and Dutch looks like German. I must say Pennsylvania German or Pennsylvania Dutch is closer to German than to Dutch though. I think it would be more difficult to understand for someone who speaks only Dutch and has no German knowledge whatsoever. And I could guess “verkafe” would be “to sell”. Same in German (and Dutch for that matter). German would be “verkaufen” and “kaufen”. In Dutch “kopen” and “verkopen” (and “verkocht” sounds like what Don Curtis mentions for sold, “verkafft”). When we moved into our new apartment the Pa. Dutch lady downstairs gave us a casserole dish. She said it was our “hashh dire” or something similar sounding. Could you tell me what that means? The add for the language class- is it sponsored by you or WordPress? I know you don’t guarantee anything…. I would like to learn the language, but I don’t want to get ‘spammed’ (haha). “*Blech! The soup schissel ist not clean! Why are these dippy eggs in a soup schissel, anyhow? -Aw, honey, don’t be so griddlich! Now stop your brillah! Ach! I need my brill! *Just let me get my strimph on…you left them on the porch with the schissel. Cold feet nein ist gut. -Wait, get that spider that’s grattlach up the bleck! Nee, not there…THERE! I think you need brill, too. *Let me get this tsupp off the can of bug spray. Darn! Now where did that confounded spider go? -It’s on the tsepp rug! -Ach, danki and praise the Herr our Gott! I cannot abide spiders. First of all let me offer an ‘add on’ to your pending kaffah/vahkaffah – discussion. You are absolutly right when converting these two verbs to buy/sell. However and especially ‘verkaufen’ is used in a second way too. In High German, also in my Bavarian dialect … “Are you serious? / You want to fool me?” (Du wuisd me woi fiah dumm vahkaffah?) … remember Terry was adding a LOL behind it anyway. When it comes to dialects you can’t never really insist on a one-to-one word translation. There is always a lot of feelings and meanings involved. I even think that people learning a dialect as a first language are more tolerant in understanding others. And for sure they like to play with their wordings. So far so good. Now the reason I am writing to you today is based on my search for people with a dialect background. Looking for Amish speaking people in particular. Why? I was translating Amish words into Bavarian. And to my great enjoyment I could find so many similarities … incredible. Here a little bit more backgroud regarding my “language/dialect project”. Why? You look up an Amish word and get Vienna German, Bavarian and Sorbian entries as well as French, Italian, Polish and so on. Our Languages are so close to each other but almost out of reach for the Chinese. They only can study pure German, pure English. You see what I mean? My intention is to introduce our dialects to the the world. In case you are interested in my activities or in case you would like to have a deeper look into my product or even want a copy of it (free of cost because it is invalueable!!!) … just let me know. I am of Dutch descent, that is, my grandparents were from Holland, a part of the Netherlands. For such a tiny country it seems to have a lots of identites. Dutch is the language spoken in the Netherlands. Deutsch is the language spoken in Germany. Germans call what we call Germany, Deutschland. Germans called what is now the Netherlands, Das Niederlands, which means outer lands. What we call Pennsylvania Dutch is a misnomer for Pennsylvanis Deutsch. That’s why they speak German, not Dutch. Loss uns Deitsche was mir sin. German as well as things that we now call Dutch. When distinctions needed to be made during that period, “High Dutch” meant German, and “Low Dutch” meant what we now call Dutch. This was the usage at the time that immigration from the upper Rhine Valley and adjacent areas of what is now (mostly) Germany into Pennsylvania took place. You can look up the history of the English word “Dutch” in the Oxford English Dictionary or another historical dictionary of English. The “Low” in “Low Dutch” has the same meaning as the “Neder-” in “Nederland” — adopted into English as the “Nether-” in Netherlands: It is “Low” meaning “low in altitude”, i.e., near sea level. High German dialects, on the other hand, are the ones that are spoken at higher altitudes further upstream and up into the highlands and mountains of central Europe — i.e., to the south of the Netherlands. Pennsylvania Dutch is a High German dialect, as is modern Standard German. There are lots more. The term “Pennsylvania German” is also used, perhaps especially in textbooks and academic papers (etc. ), and it means exactly the same thing as “Pennsylvania Dutch”. It does have the advantage that it keeps people who don’t know the language or the history of the Pennsylvania Germans from be confused and thinking it has something to do with the Netherlands. Nonetheless, some recent textbooks and academic works have returned to a preference for the historically more common term “Pennsylvania Dutch”. In the interest of full disclosure, I should mention that I am not myself any kind of Dutch (neither Pennsylvania nor Netherlandish) by ancestry or nationality, though I have studied both Pennsylvania Dutch and (Netherlands) Dutch, in addition to standard German. Leave a reply to Do you know these 12 similar Pennsylvania Dutch words?